The letter is an entertaining read, but the handwriting is not easy – Vicky’s transcript follows beneath the scanned copy. I heard of Lovery lately from the hearths of Wick – I think the second sister is staying in Oxford – Pray tell me if she is, and what you think of her – she took wonderfully with me not so much for her personal appearance as for her good qualities – which were remarkable – I found a strong contrast to some other members of her family . If old Conway Lovery (or rather, young ) is in Oxford pray tell me & remember me to him as I should like him to come a & spend two or three days at Xmas. We have a pleasant curate just arrived. He was at East Garlton in the summer months cooking at the curacy – His name is Davis – he is very gentlemanly – keeps two carriages & preaches extempore in a manner not unwitting of a metropolitan pulpit – I have not visited Price recently – I rather think that he has voted me a bore, as he has hinted two or three times on the expense of going to Worcester to see Mr Lechmore, so I trouble him as little as possible – I suppose you know old Sir Winnington is translated to another world – I do not know his son. It is a great difficulty this to lie by and let my “wanton zeal mould in roosted sloth” – but I groan & endure & read books of a voluminous size from the library being relieved from my monotony by being visited by about one patient a day – & an occasional bit of cheating at vingt un with some of the fair agricultural nymphs of this vicinity – among whom I am sorry to say that I cannot help maintaining my ancient character for being fond of a bit of “getting upstairs and playing the fiddle”. I say sorry, because all the world expects a medical man to be always wrapt up in an odour of gravity – in fact to assume a humbugging puritanical deportment which it is my misfortune to lack – time, however, which will soon turn me bald, may perchance give me a due share of that other inestimable quality. In your letter of October 4th – you describe my letter as a non descript one – What will call this? – Something of the same sort. My hand is quite out – I have written to no one & for no one. I am obliged to take up with the subjects of conversation I meet with, instead of enjoying the company of any rationally educated people – It is therefore marvelous that the product of my brain should be a rambling hodge podge , a pot pourri as the Gauls have it. Besides when I take up my pen in your behalf I have so much to ask you & so much to say that I scarcely know where to begin far less where to end. I thought therefore that your reverence will not measure my feeble epistolary power by your own signature ones – but will be taken into your generous consideration that, however great a jumble & even concentration of ideas – distinct or otherwise there may be in my cranium – yet I am not weekly exercised by the utterance of them in writing of humour (not that I mean to say you with your own nor anything to the contrary) as you are. Nor am I in a classical soil – Genius within this country – men whose talk is of bullocks abound here to the exclusion of all others. I wish you would lend me your pistols for a short time when you don’t want them – they would afford me a small variety in my retreat & I want to shoot a dog or two which always fly at me – & in kicking of whom I hurt my toe – you shall have them back honor bright. The day after I sent your box , Perrott sent me a new copy of Coleridge – all three vols which is the one you have – as I may as well keep the other I send you the two. You did not tell me whether all the books were right – I think my “Bacot on Syphilis” is amongst your books – Please take care of it. [John Bacot’s “A Treatise On Syphilis” (London, 1829). ]Can you tell me how long Henry will be in Paris ? I would like to commission him to get some bougies [A thin flexible surgical instrument] if I knew his address – Bloxham knows a gentleman in the customs at Dover who would pass anything for him – It is the india rubber bougies & catheters which I mean and which are made so much better in Paris than anywhere else. Plague upon it – I just see by referring to your letter that Henry is in London – when we get the penny postage I’ll write him a letter. Apropos Remember me to Penny – and B.M. Hullo! I’m here at Outwood Academy in Newbold for the annual family history fair run by the Chesterfield and District Family History Society – feel free to drop by if you are in the vicinity. Our stall is right next to m’colleagues from Chesterfield Library‘s renowned local studies section and opposite the equally-renowned Chesterfield Museum. I can also spot Derbyshire Record Society just over there in the middle. I’ll wander over and say how do in a minute. If you’re in Chesterfield tomorrow (Thursday 11 August), why not pop in to Chesterfield Museum and find out how to look after your old family letters and photographs? My Preserving your Past talk starts at 1.00pm and explains how our treasured possessions can get damaged and what you can do to ensure they’ll survive for future generations to enjoy. Feel free to bring along letters, books and photographs if you would like some specific advice after the talk – I’ll be there till the museum closes at 4.00pm. There was a great turn-out at Chesterfield for the launch of Maureen Greenland and Russ Day’s new book, “Bryan Donkin: The Very Civil Engineer, 1768-1855”. The town is rightly proud of the company that Donkin created, and the legacy of technological innovation that it leaves us. We were also lucky to hear from former Donkin managing director Terry Woodhouse, who told us about his first encounters with the Donk in archive, which he was instrumental in preserving for future generations. Terry described just a few of the ideas that Bryan Donkin’s talents and perseverance were able to turn into a reality: a machine for making paper, the first cans for preserving food, more efficient nibs for pens, an anti-fraud device used in the manufacture of bank-notes. One can argue that Donkin has never been given full recognition for his achievements – that’s something that this book will undoubtedly address. Genius deserves to be celebrated. So please do join us in celebrating the genius that was Bryan Donkin by coming to the launch of a ground-breaking new biography of the man, written by Maureen Greenland and Russ Day. The book draws heavily on the archival legacy of Donkin and the company he founded, which was based in Chesterfield from 1902 onwards. Some of the most striking and noteworthy of those documents, including original engineering drawings, will be on display at the launch, which is at Chesterfield Library on Tuesday 19th July at 4.30pm. There will also be a chance to meet the authors (and get them to sign a copy of the book) and to hear from Terry Woodhouse, who was the Managing Director of the Bryan Donkin Company for a number of years. It’s a free event, with light refreshments available, so do come along. You can book your free ticket by calling in at the library, or by telephone on 01629 533 400, or by email to chesterfield.library@derbyshire.gov.uk. Have you heard the one about the woman who lived on a tram? Few virtual postbags can be quite as varied as our regular slew of email enquiries – this one’s a belter. Val Howels of Devon has written to ask if we have any information on “the indomitable Miss Florence Sharpe”. Val asks for the best and noblest of reasons – she is writing a children’s book. The book is set to be a true story about the life of a woman who really did live on a tram, for a number of years (specifically, Chesterfield Tram No. 7). Florence herself died in 1982 at the age of 90 – so what the author would like most of all would be the chance to chat to any relatives, who might be able to pass on any informative snippets. Florence was the sister-in-law of a Mr Harry Cocking, who owned the tram before his death in 1949. Are there any surviving members of the Sharpe or Cocking families who would be able to help? 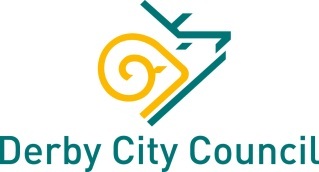 If so, please email record.office@derbyshire.gov.uk and we will put you in touch with Val. It’s always nice to have something to illustrate a blog post, so here’s a link to a YouTube clip filmed on board Chesterfield Tram No 7 at Crich Tramway Village. Until the last decade, coal mining was once one of the biggest industries in the East Midlands, especially in Derbyshire which had many mining communities when the industry was at its height. Just a few of months ago, the UK’s last deep pit coal mine closed for the last time. Another deep pit mine will close in December (Kellingley, in North Yorkshire) and after this there will be no more deep pit mines in the UK. This is of particular historical significance because it reflects the changing nature of British industries and economy. There is also an underlying theme about workers rights which originates from the Magna Carta. Employment rights, equal pay, fair working conditions and the right to protest have featured heavily in the loss of the mining industry. Over the centuries they have developed to become apparent features of human rights, which have evolved from the original Magna Carta clauses. Because of the impact of Magna Carta over the course of history, it remains our democratic right to be able to protest for fair employment rights. 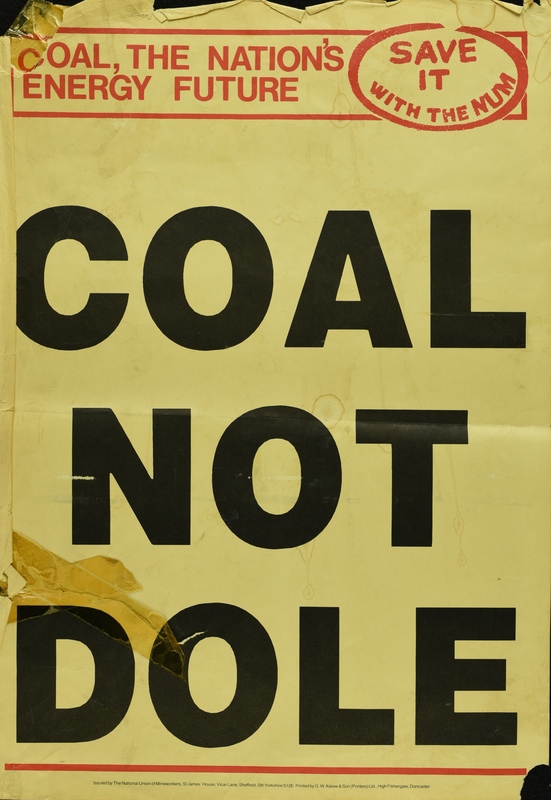 This featured poster with the slogan ‘Coal not Dole!’ (D5756/5-7) was issued by the National Union of Mineworkers during the Miners’ Strike in 1984-85. Although not overly exciting to look at, it deals with the point relating to workers rights and employment. Perhaps it reminds you of this event? A few months ago a blog was published about the Magna Carta as part of the Mini Explore Your Archive campaign. This year’s main Explore Your Archive week starts this Saturday. For this year’s event we are welcoming poet and designer Jane Weir to the record office to talk about her work, inspired by archive collections. To find out more about this free event or to book a place go to the Events page on our blog (just scroll back to the top of this page).